How does this happen? That busyness reigns supreme, that ambition drives the day, that exhaustion connects moment with moment, that, well, we simply forget to pay attention to what is noble and grand and really important. That we ignore what is truly beautiful and possible. How does this happen? Days pass by and we are mostly oblivious. We simply pay little or no attention to our potential power, to the passage of time, to wonder, to the incredible beauty that emerges when shadow dances with light. We tend to be deeply uninvolved and forget how we have emerged from the days that we were afraid to be ourselves, the days when we were hesitant beings. Remember those days when we blinked and twitched as we tried to find our place in society, to discover our way through family craziness? Do you remember when we desperately searched for a strong sense of self that would withstand the push and pull of life? I remember. And if I were to be completely honest, I don’t have to reach back into memory. I still blink and twitch and I am still discovering my way. Maybe that’s why we choose to be so busy, so distracted by nothing much, because to be aware is, can be, complicated. But we are invited every so often by the rhythms of the Jewish calendar to transcend our very human tendency towards oblivion. We are invited to gain a sense of footing, to lift our eyes beyond the mundane and think and learn, consider and see, really see what is possible and interesting and fantastic in our lives. Now, with the ever-slow emergence of spring and sun and warmth and the undeniable regrowth of color we have our chance. Seven weeks, forty-nine days, separate Passover and Shavuot. And for those forty-nine days our tradition gives us a simple command – to count. Count each day, for forty-nine days, one at a time, and pay attention. Take time back from oblivion and to notice. 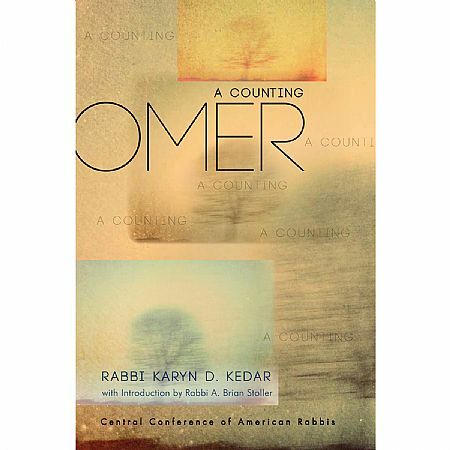 Though the counting of the omer is an ancient tradition connected with the harvest in the Israel, today it has become a spiritual practice. Like all spiritual practices there are tools, which help us stay focused on the journey. For years, during the counting of the Omer, I have sent daily emails, short passages, some from Jewish tradition, some from the wisdom of great thinkers, some original writing. Every passage ends with the short blessing, which counts the sequence of days from the first to the forty-ninth. These passages are like a bit of sweetness delivered to your mind and heart; a daily invitation to breathe, to pause, to reflect. Reflection. It is the nectar of a considered life. And our lives are worthy of our consideration. Each day. One day at a time. Making our days count for something grand. Rabbi Karyn Kedar is the senior rabbi of Congregation BJBE in Deerfield Illinois. She is the author of several books including Omer: A Counting, published by CCAR Press in both paper and as an ebook. This book includes passages for counting the Omer as well as seven spiritual principles to consider each week. You can also sign up for her blog at karynkedar.com. I’m not even sure how to address you. How should I call you? I read your book “God Whispers”. Each word you write resonates in me like it was always part of my own thinking. Something simple, essential and spiritually nurturing. It never felt so right to count “One day at a time”. Thank you for sharing so naturally. PS: I apologize for any mistakes: English is not my mother tongue.